Stop Thinking Start Living is the title of one of my favourite books, and one that I re-read from time to time. 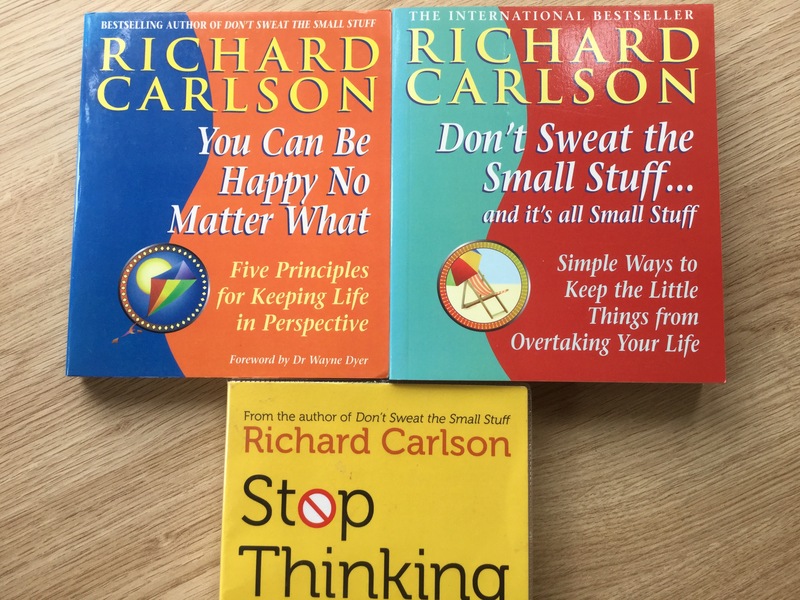 Along with other books by Richard Carlson (who sadly died in 2006 aged just 45) these are powerful life-changers and inspired me to write this blog article about the importance of ‘switching off’. One of my favourite sayings is ‘Your thoughts are a self-fulfilling prophesy’. And with all the recent publicity about mental health, it is perhaps important to understand that so many conditions such as OCD, panic attacks and depression are symptoms of us running too many conversations and movies in our heads. We become victims of our own thoughts. We do our own heads in. In theory, our thoughts aren’t real, and as such can’t harm us. But they do harm us, because you can’t feel something without first thinking about it, so our thoughts become feelings. As a Hypnotherapist and Master Practitioner of Neuro Linguistic Programming I am totally opposed to so many traditional therapies and modern ways of dealing with problems or traumatic events. Every time you talk about something and then analyse it, you bring it to the front of your mind and allow yourself to think about it. And thinking about a past event doesn’t solve it, it just makes you feel bad again…..and again….and again! And in many cases intensifies the horror of what happened. The key to a happy life is to devote as little time as possible to thinking about past events or problems. I recently read somewhere that thinking about a problem won’t solve it, because you are constrained by the solutions you already know, and that to solve it the best thing to do is NOT think about it. That was what prompted me to reread Stop Thinking Start Living. Anyone suffering from any form of unhappiness, anxiety, depression or loneliness would do well to read it. Our thoughts have an amazing power over us, and yet ironically we are in control of our own thoughts, or should be. It is thinking that turns events into problems, even events that don’t directly affect you e.g a photo you see on Facebook. It is not the event that causes an emotional response, but your thinking about it. And your thoughts aren’t real. Being upset by your own thoughts is a bit like writing yourself a threatening letter, and then having sleepless nights because of it! Your thoughts only have the power that you choose to give to them. Strange as it may sound, it is your thoughts that create your experience of life, not the actual experiences. The thinking is something you choose to do and which you then overlay with feelings to magnify the experience. If you think too much about your problems, you don’t become an expert in solving them, but rather you become an expert in thinking about problems. And probably someone who bores their friends to death talking about them! You would do far bettter to rely on your inner wisdom, as that will help you see a situation or a problem in a fresh way. One of my favourite sayings of Paul McKenna is that everyone can choose to have had a happy childhood. Your past isn’t real, in that it isn’t happening now. It’s just part of your imagination and you can re-imagine it however you wish. Mental health problems are typically about someone being absorbed in their own negative or obsessive thinking. Genuine sadness is a natural part of life, but the key to a happy life is not allowing that to turn into negativity or depression. Gratitude is a very powerful antidote to depression, so rather than thinking about problems or sad events, it is valuable to focus on things you are grateful for. Positive thoughts will produce positive emotions! One of the most valuable skills to have in life is the ability to switch off or change the thoughts in your head, because to be happy the only thing you need to change in your life is your own thinking. There are so many things in life that you can’t control, but you can control your own thinking. As Richard Carlson said “There is no benefit in thinking about an event from the past more than once.” If you are depressed, STOP THINKING! And to do that you may need to exercise, listen to music or simply take the dog for a walk! This article has been written by Pamela Carvell in May 2017, but I may have unknowingly quoted Richard Carlson in several places, as I have read so many of his books so many times! This article represents my views and may be reproduced so long as I am given full credit. This sounds like a book that is right up my alley, and that I could use in my life right now. Sometimes it is so difficult to juggle everything that’s going on in life and it does result in a stressed out state of mind, which in my case has an effect on me but also the people around me. I’m still learning to let things go quicker so thanks for this suggestion. Looks like a helpful book, with a great message. Thank you for taking the time to make a positive comment. I have just applied to join the Facebook group you mention, as it looks good – thank you! It was my pleasure, it was a very interesting read. Fantastic, see you there!